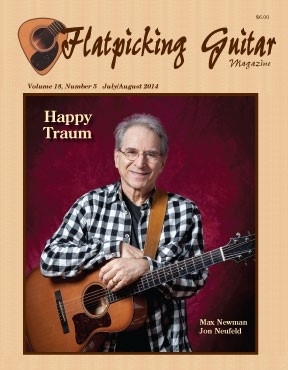 Welcome to the digital download edition of the July/August 2014 issue of Flatpicking Guitar Magazine. This is Volume 18, Number 5 of the magazine and in this issue we feature Happy Traum of Homespun Tapes fame on our cover. We also feature Jon Neufeld, a guitarist from Portland, Oregon, who plays for Sugar Hill recording artist Black Prairie and the bluegrass band Jackstraw. Additionally, we feature Max Newman, a contra dance guitar player from Massachusetts who plays with a popular touring contra dance band, The Stringrays. Our regular columnists also have some very nice tunes for you to work with. We hope you enjoy this edition of Flatpicking Guitar Magazine! Happy Traum and "Buckdancer's Choice"